Call Caliper at +1 617-527-4700 to place your order, download the Maptitude order form and fax it to +1 617-527-5113, or use the Caliper Store. Each Maptitude licence can be installed and activated on a single computer. This includes the desktop/remote/concurrent/cloud licenses. (Upgrades not included) US$695 New Single-User License with one FREE Country Package including maps and (where available) demographic data. Single-User Upgrade for Maptitude 2017 or later. A new version of Maptitude is released in the first quarter of each calendar year. US$395 Single-User Annual (optional) Upgrade with one FREE Country Package including maps and (where available) demographic data. Include serial number with order. 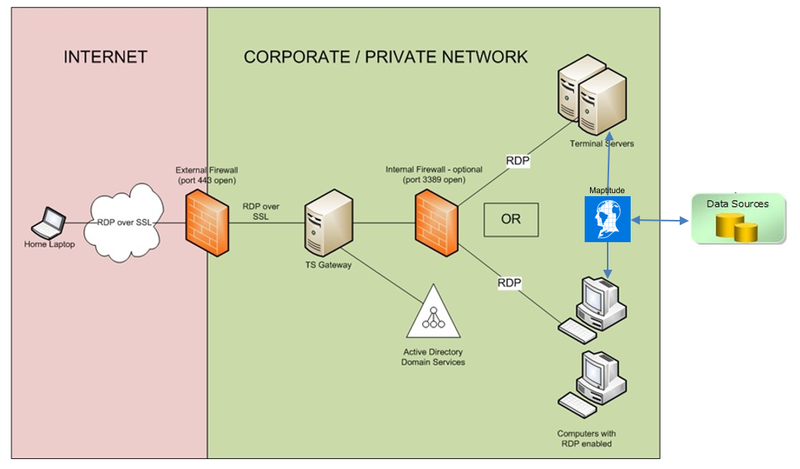 Remote, Cloud1 Single-User or Multiple-User License (See Architecture Diagram) US$995 per Simultaneous/ Concurrent User New Remote desktop or concurrent-user license (including VPN, Amazon Cloud1, Terminal Services, or Citrix Server environments); Includes one FREE Country Package with maps and (where available) demographic data. Each simultaneous license is US$995. Remote, Cloud1 Single-User or Multiple-User License Upgrade US$695 per Simultaneous/ Concurrent User Remote/concurrent-user Upgrade with one FREE Country Package with maps and (where available) demographic data. Each concurrent upgrade is US$695. Include serial number with order. Maptitude Web-Based Training US$250 One hour of training provided via web conference. The live training is exclusive to your organization and is open to as many trainees as you require. A training video is provided after each session. Custom and standard curriculum available. Maptitude Classroom Training US$300/day Caliper offers three days of classroom training covering a variety of topics. Click here for class dates and descriptions. Maptitude Country Package US$595 Requires Maptitude. Countries available include: United States (2019), Argentina (2012), Australia (2019), Brazil (2019), Canada (2019), Chile (2015), Colombia (2017), DACH (Austria/Germany/Switzerland) (2018), Ecuador (2013), France (2013), India (2013), Italy (2013), Mexico (2019), Netherlands (2013), New Zealand (2019), Peru (2014), Portugal (2012), Russia (2013), South Africa (2013), Spain (2015), and United Kingdom & Ireland (2019). Census Block Groups US$250 Requires Maptitude. Nationwide area database with 220,180 block groups and Census demographic data. Census Blocks US$795 Requires Maptitude. Nationwide area database with 11,102,478 blocks and with 147 fields of Census demographic data. Congressional Districts US$495 Requires Maptitude. Nationwide area database with Congressional District boundaries and Census demographic data. Prices are in U.S. Dollars and exclude tax and shipping. Orders received before 3pm (Eastern Time) will be processed the same day. Orders received after 3pm usually ship same day, but may be processed on the next business day. The purchase and use of Maptitude is subject to the terms and conditions found in the Maptitude End User License Agreement (EULA), available here. 1 Installation in the Amazon Cloud requires you to have an Amazon EC2 Microsoft Windows Instance which you access via remote desktop. Maptitude (Amazon Cloud) is available as a download only. 2 To be eligible for the discounted student license you must provide a copy of a document (School ID, Report Card, Transcript, or Tuition Bill) issued by the institution with your name, the institution name, and current date. Caliper provides a comprehensive program of technical support, training, and consulting services to ensure the success of your Maptitude applications. Caliper offers hands-on training classes for Maptitude in classroom settings, or on-site at your location. Our training can be customized for your specific needs and user group. Maptitude includes a comprehensive Help system with background information, step-by-step instructions, and a series of hands-on tutorials that let you try out features. In addition, a learning portal, tooltips, and other on-screen visual cues also make Maptitude easy to learn and use. Caliper offers a full range of GIS implementation services. Our GIS professionals will assist you in assessing data requirements, database strategy and design, database development, and analytical modeling. Caliper also provides custom application and turnkey system development services, including web site creation. Maptitude Polo Shirt US$25 100% heavy-weight cotton polo shirt in navy embroidered Maptitude logo. Plus shipping and tax (where applicable). Versions: There are two versions of Maptitude: the US$695 version that is typically installed on a local Windows device such as a PC or Surface Pro; Or the US$995 remote desktop version that is typically installed on a Citrix or Terminal Services server or on a standalone Windows device when accessing Maptitude via RDP. Desktop or laptop computer running Windows 10, 8.1, 8, or 7. We do not recommend using netbooks. DVD-ROM drive or an Internet connection for download. We recommend a DVD drive for users with slow internet speeds or download/security issues. 10 GB of storage space for Maptitude and the US Country Package. More space will be required to save the maps and files created with Maptitude. Maptitude can always read Microsoft Office tables (e.g., Excel). Microsoft Office can be 32-bit, 64-bit, or not installed.